The 6th New York Cavalry Monument on Buford Avenue along McPherson’s Ridge, is now the center of a construction site since it was struck by lightning in the fall of 2007. The Eternal Light Peace Memorial (Peace Light) is in the background to the right of the scaffolding surround the 6th New York. 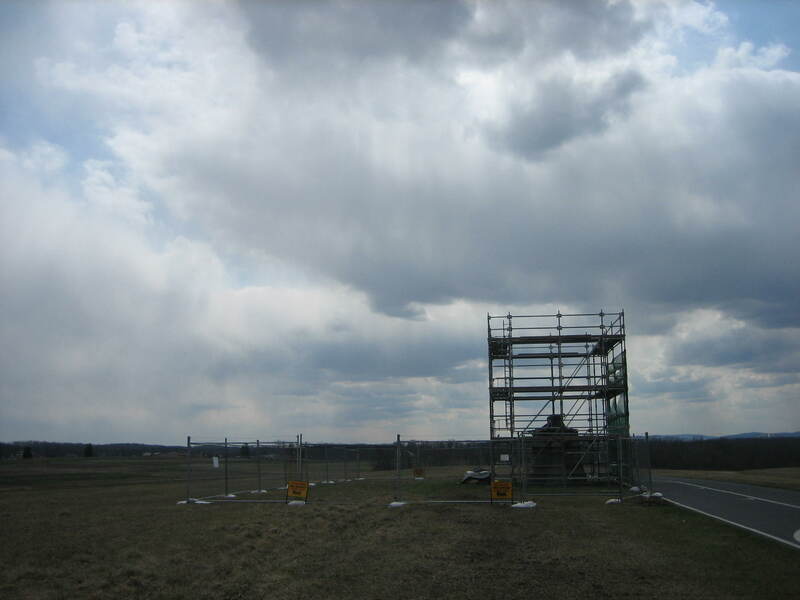 This view was taken from the south facing north at approximately 2:15 PM on Monday, March 24, 2008. 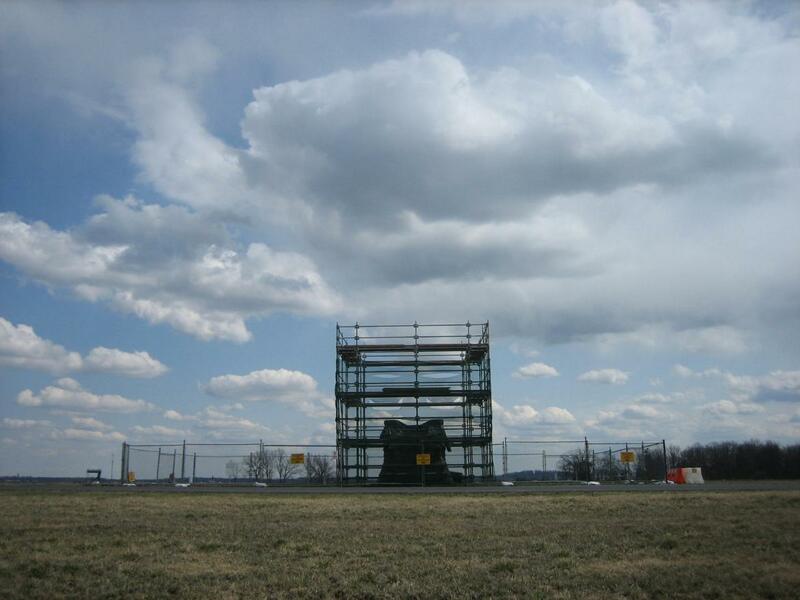 The The Gettysburg Daily decided to take a look at the progress on the 6th New York Cavalry Monument, and unfortunately, there isn’t very much. The monument, on Buford Avenue along McPherson’s Ridge was struck by lightening on October 9, 2007, and was beginning to fall apart. The top section has been removed so it can be repainted and reworked. 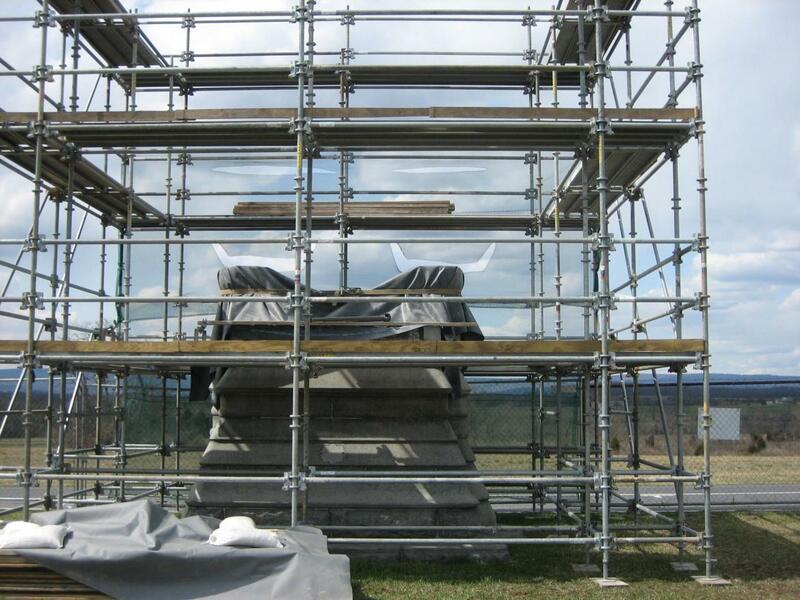 Scaffolding and fencing surround the monument. The 6th New York Cavalry monument was dedicated in 1889 to the regiment which fought with Brigadier-General John Buford’s cavalry division on July 1, 1863. The regiment was formed in October 1861, and in December, 1861 was sent to York, Pennsylvania for training. Colonel Thomas Devin, later their brigade commander at Gettysburg, was their first commander. View from the east facing west at approximately 2:15 PM on Monday, March 24, 2008. The 6th New York fought dismounted along the ridge, firing at Confederates that charged from west to east, or right to left in this picture. Approximately every fourth man would have been in the low ground or swale to the left in the photograph, holding horses out of sight of the enemy. View from the north facing south at approximately 2:15 PM on Monday, March 24, 2008. Buford Avenue, in front of, or west of the monument, may have to be closed sometime between now and May 9th when North Reynolds Avenue, where the bridge is over the railroad cut, is also being repaired. Therefore, a large section of the July 1st battlefield between the Chambersburg Pike and the Mummasburg Road may not easily be accessible to visitors this year, the 145th anniversary of the battle. View is from the west facing east at approximately 2:15 PM on Monday, March 24, 2008. Casualties for the 6th New York Cavalry at the Battle of Gettysburg were one man killed, five wounded, and 16 missing, for a total of 22. 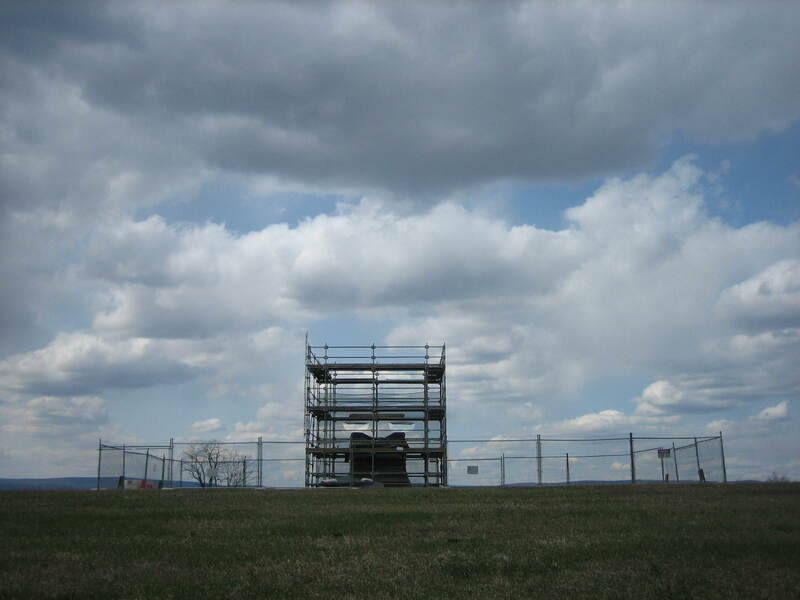 Because a tarp and fence is protecting the west side of the monument, it is difficult to obtain a good picture of what remains. 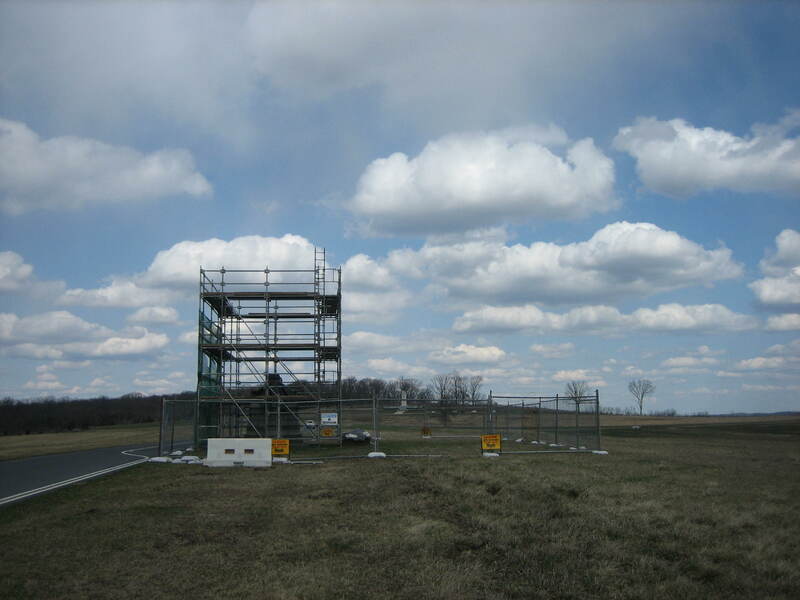 View from the southwest facing northeast at approximately 2:15 PM on Monday, March 24, 2008. 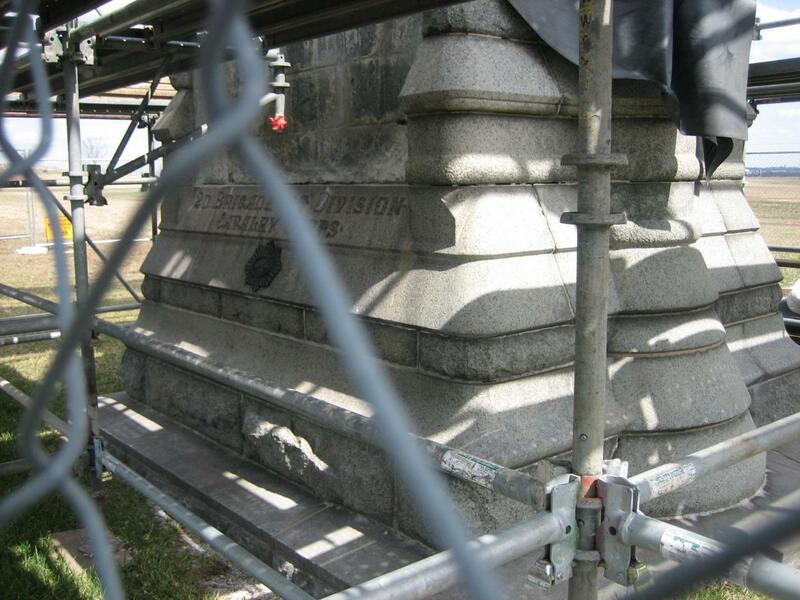 Initial estimates by the National Park Service state it will take approximately $100,000 to repair the monument. The monument originally was 26 feet high on a base that measured 14 feet wide (north to south) and 10 foot long (east to west). A light yellow strap and and a tarp that can be seen at the top of the monument are used to hold this base together, and protect it from the elements. View is from the east facing west at approximately 2:15 PM on Monday, March 24, 2008.